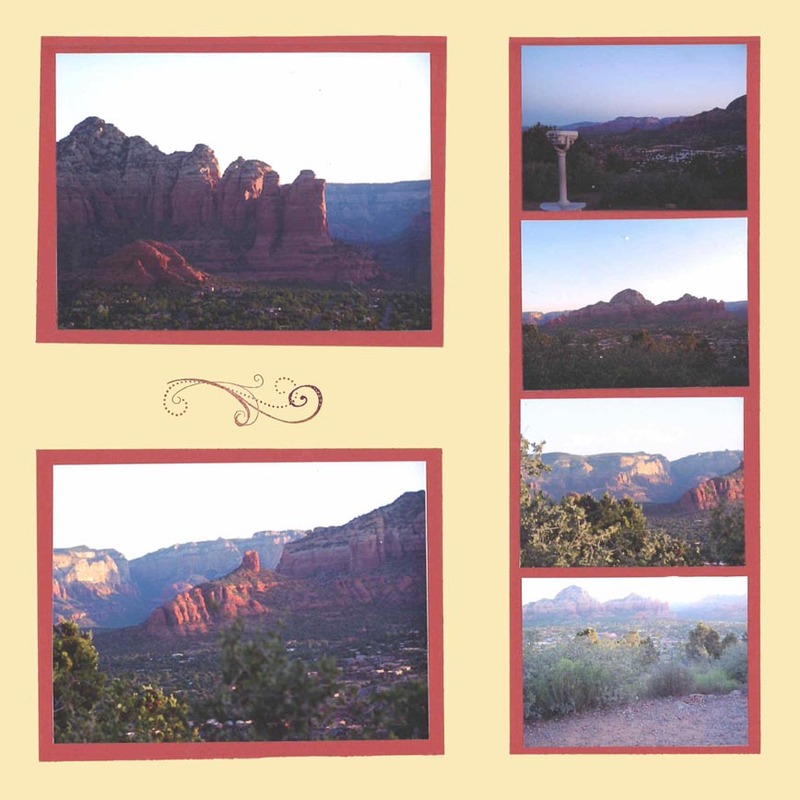 Taking these pictures of the Sedona sunrise was a simple act of clicking the shutter. Getting to the spot where I took them required a bit more effort. When we went to bed Wednesday night, John had been adamant that he was too tired to get up to view a sunrise, no matter how potentially breathtaking it might be. I wasn’t sure I’d have the confidence to do it on my own, but I set the alarm for 4 a.m. just in case. I woke up frequently during the night, and looked at the clock each time: 11:30. (Gosh, I’ve only been asleep for an hour or so.) 1:30. (Still too early. Go back to sleep.) 2:30. (Nope, not yet.) At 3:45 I turned off the alarm. “I’m really comfortable. Maybe I’ll just sleep in, too,” I thought. And that’s when she started in on me. Damn. No matter where I go, that little internal voice won’t leave me alone. “But you said you wanted to do this,” she prodded. “Yeah, you’re probably right,” I conceded. Sometimes her nagging is actually helpful. I jumped out of bed, not in a courageous leap, but quickly, so I didn’t have time to change my mind. Fearing I’d hesitated too long and might now miss the whole thing, I grabbed the clothes I’d laid out last night (also just in case) and hastily put them on. After a quick trip to the bathroom, I opened the door, closed it quietly behind me―and was startled by the darkness. I knew that. Nonetheless, I wasn’t prepared to see it. Of course the room had been dark, but with the heavy draperies motels use, it’s not uncommon for it to be dark inside and bright outside. Good thing I hadn’t given it any conscious thought or I might not have gotten out of bed after all. There was just enough light from the dashboard to see the street names on the map. Unfortunately, reading the actual street signs was harder. (If only my eyes were still as sharp as when I read Nancy Drew books under the covers. ) What if I’d already passed Airport Drive? How long would I go before I gave up and decided I’d missed it? The last thing I wanted to do was make a u-turn and look foolish. I stopped paying so much attention to my doubts and settled in to enjoy the ride. And suddenly there it was: Airport Drive. Wow, I’d found it! From this point on the map showed no more street names, just a squiggly line that ended at Airport Mesa. No problem. I didn’t have time for the map now anyway. That squiggly line was in reality a narrow, winding road up the side of the canyon, and driving it demanded my full attention. Suddenly there it was, the vista point parking lot. I’d found it on my own without any miscues or even one u-turn! After gathering my camera, journal, and flashlight, I double-checked to make sure I’d put the key in my pocket. (I certainly didn’t want a repeat of the San Francisco vista point experience.) Then literally grinning from ear to ear, I walked across the road to watch the sun rise over the red rocks of Sedona, Arizona. In 1988, on my first solo travel adventure, I was driving a friend’s car from San Jose to Marin County, California, when I saw a sign for a Vista Point. “Why Not?” I thought. So I got off the highway and headed up the side of a mountain. That time, too, I made sure I had the car key with me before locking the doors. Unfortunately I didn’t know that unlike my Camry, my friend’s Pontiac Firebird required two keys: one for the ignition and one for the door locks. I obviously had the ignition key, but my friend had failed to give me the one to unlock the doors. For the details of how I got the car―and me―off the mountain, read that 1988 story. This entry was posted in Guest writer and tagged Sedona, travel. Bookmark the permalink.